The Jewish immigration to Puerto Rico began in the 15th century with the arrival of the anusim (variously called conversos, Crypto-Jews, or Secret Jews and marranos) who accompanied Christopher Columbus on his second voyage. An open Jewish community did not flourish in Puerto Rico because Judaism was prohibited by the Spanish Inquisition, however many migrated to mountainous parts of the island, far from the central power of San Juan, and continued to self-identify as Jews and practice Crypto-Judaism. It would be hundreds of years before an open Jewish community would be established on the island. Very few American Jews settled in Puerto Rico after the island was ceded by Spain to the United States under the terms of the 1898 Treaty of Paris, which ended the Spanish–American War. The first large group of Jews to settle in Puerto Rico were European refugees fleeing German–occupied Europe in the 1930s and 1940s. The second influx of Jews to the island came in the 1950s, when thousands of Cuban Jews (most of Eastern-European descent) fled after Fidel Castro came to power, the majority immigrating to Miami, Florida, with a sizable portion choosing to establish and integrate themselves on the neighboring island because of the cultural, linguistic, racial, and historic similarities shared by both islands. Puerto Rican Jews have made many contributions in multiple fields, including business and commerce, education, and entertainment. Puerto Rico has the largest and richest Jewish community in the Caribbean, with over 3,000 Jewish inhabitants. It is also the only Caribbean island in which all three major Jewish denominations—Orthodox, Conservative, and Reform—are represented. The leading communal organization is the Centro Israelita Sionista de Costa Rica (CIS), founded in 1937. There is also a reform congregation in the capital San José, as well as several active Jewish groups that include WIZO, the Jewish Women's Welfare Association affiliated with the International Council of Jewish Women, Bnai Brith, Keren Hayesod. The Jewish Sports Center is the venue of Jewish athletics and has a Kosher restaurant. The Centro publishes a weekly bulletin devoted to spreading Jewish traditions, local and international news, etc. San José’s main synagogue, Shaarei Zion, is served by an orthodox rabbi. There is a burial society and a Jewish cemetery. Kosher food is available. The Jaim Weizman School, which includes a nursery, kindergarten, elementary and high school, is attended by the majority of Jewish children. Israel and Costa Rica enjoy full diplomatic relations. Until 2006, Costa Rica was one of only two countries world-wide to have an embassy in the Israeli capital Jerusalem, but following a decision by then President Oscar Arías, its representation was moved to Tel Aviv. For kosher food in Costa Rica, please consult the webpage of the Centro Israelita. It’s a familiar story: Times are tough in Eastern Europe. The father makes his way across the ocean to America to try to build a better life for his family. He establishes himself, sends for the wife and kids, and they all struggle to make a living and adapt to a new culture and a new language. The difference is the new language is Spanish, and the America they came to is Central America — Costa Rica to be specific. My husband and I were in Costa Rica for a few weeks escaping the Pittsburgh winter and getting to know the Jewish community. We spent Shabbat in several different places during our visit and ate at three different kosher restaurants. Our visit to the small Museum of the Jewish Community of Costa Rica filled in some blanks in our knowledge of local Jewish history. Although the first Jews to come were Conversos fleeing the Inquisition, that group assimilated and left no Jewish traces. The first real wave of Jews came to Costa Rica in the 1920s and 1930s fleeing persecution and economic hardship in Eastern Europe, primarily Poland. They were peddlers, going door to door, knocking and selling. They were called Klappers, or Polacos, terms that are now used to mean any peddler. They built their first synagogue in 1930. After World War II, Polish Holocaust survivors came to reunite with their relatives who had come earlier. (Almost the entire modern Costa Rican Jewish community has originated from one Polish town, Yelechov, aka Zelechow.) Close to 200 Holocaust survivors still live in San Jose, the capital. The Jewish community thrived and is now 3,000 strong, the vast majority professionals or business owners, living in or around the capital, San Jose, and are financially successful. In 2004, the community constructed a new facility, the Centro Israelita Sionista. Built of Jerusalem stone, Centro Israelita is the principal institution for the Jewish community of Costa Rica. It has offices in a vast compound encircled by a massive wall over 15 feet high. Behind that protective wall lies the huge and beautiful Shaarei Zion Synagogue, the museum of the Jewish community, the youth organization’s headquarters and activities, a senior center, a kosher restaurant and offices for all the other educational and social activities such as the women’s group WIZO, the cemetery and the Chevra Kadisha. There is also a women’s mikvah, a men’s mikvah and a utensils mikvah. Though the synagogue and the rabbis are Orthodox, many congregants drive to shul on Shabbat. There are a handful of shomer Shabbat families, but the entire community of 3,000 comes for Rosh Hashanah and Yom Kippur services. The Shabbat we were there, 50 men and 25 women came to daven. The services were in Hebrew and the rabbi’s talk was in Spanish. After services, we all sat down together to a sumptuous meal including bread, fish, salads, cholent, drinks, fruit and cake. Everyone schmoozed, paid attention to the children, relaxed and lingered together. The community was very warm and welcoming to us. We entered a small, very modest house, with no adornments on the walls and the only furniture in the main room being a large table surrounded with many chairs. Seated around the table were another half dozen or so men, dressed in a variety of styles, including the Meah Shaarim mode. At the head of the table was an older man with a white beard and peyos, wearing a shtreimel and speaking in a combination of Hebrew and Spanish. He switched to English when we came in. One of the men motioned me to the back, where there was a simple curtain strung up. I walked past the men and behind the curtain, which separated the room from the backyard. A long table had been set up outdoors and about eight women were sitting around or tending to children or going in and out from farther back in the yard. They were all wearing long-sleeved tops, long skirts and head scarves. The table was stacked with siddurim and Tehillim in Spanish and Hebrew. I sat down, and we started to talk. They explained that their rabbi spoke to the women (from the other side of the curtain) every Shabbat for an hour or more on the Torah portion. We talked about their head coverings (their rabbi ruled a woman had to wear two head coverings so they opted for scarves instead of a wig). Then they all took a break in the conversation to daven. They were careful about placing the holier book on top of the less holy book. As far as I could see, they were very careful about everything they did religiously. When they used Hebrew terms, the pronunciation was very Yiddish-Ashkenazi. They explained that their rabbi was a tzadik from Eastern Europe and they were learning Ashenazi orthodox. Se’udah shelishit was meager; the building, the congregants and everything about the place read “poverty” similar to places we had seen in poor religious communities in Israel. When I asked if they were born Jewish, I was astonished to hear that none of them was born Jewish: they were all native Costa Ricans who had undergone Orthodox conversion through a beth din consisting of their rabbi and two rabbis from Monsey, N.Y. The entire congregation was Costa Rican gerrim (converts) being trained to be haredim. Every Shabbat, they all stayed over in their rabbi’s house and ate all their Shabbat meals together there. Just a few miles from Centro Israelita, in a nondescript house in a tony suburb, Chabad has a small Shabbat minyan. The sh’luchim have been in Costa Rica almost 20 years; their main activity is running a Jewish school. Friday night, the rabbi spoke in Hebrew, and Shabbat day in Spanish, because many of his congregants are Israeli. About a half dozen people stayed for the simple but adequate kiddush served outdoors in the back patio. We saw but didn’t visit the one other synagogue in San Jose: B’nai Israel, affiliated with both the Reform and Conservative movements. It has a very small membership, the majority of whom are either ex-pats or Costa Rican men who have intermarried. When I asked him if there was anti-Semitism in Costa Rica, he answered, in typical Jewish fashion, “Where isn’t there anti-Semitism?” But he hastened to point out, in the six months that he spent running for office, his religion only came up one time — and he was elected. Lieberman’s family moved to Costa Rica from Poland before World War II. His grandfather was the first mohel in Costa Rica; he has come a long way from his immigrant ancestors who were looking for, and found, a better way of life. 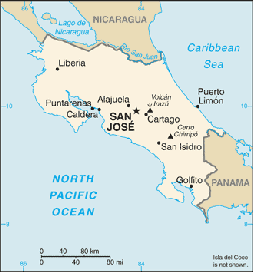 The first Jews in Costa Rica were probably conversos, who arrived in the 16th and 17th centuries. In the 19th century Sephardic merchants from Curaçao, Jamaica, Panama and the Caribbean followed. They mostly lived in Central Valley and were soon assimilated into the country's general society and eventually gave up Judaism altogether. A third wave of Jewish immigrants came before World War I and especially in the 1930s as Ashkenazi Jews fled a Europe threatened by Nazi Germany. Most of these immigrants came from the Polish town Żelechów. The term Polacos, which was originally a slur referring to these immigrants, has come to mean door-to-door salesman in colloquial Costa Rican Spanish. The country's first synagogue, the Orthodox Shaarei Zion was built in 1933 in the capital San José (located along 3rd Avenue and 6th Street). Along with a wave of nationalism, there was also some anti-Semitism in Costa Rica in the 1940s, but the co-existence between the Jews and the Catholic majority has only led to few problems. Recently there has been a fourth wave of Jewish immigration consisting primarily of American and Israeli expatriates retiring or doing business in the country. The Jewish community now consists of 2,500 to 3,000 people, most of them living in the capital. The San José suburb of Rohrmoser has a distinct Jewish presence. A couple of synagogues are located here, as well as a kosher deli and restaurant. The Plaza Rohrmoser shopping center has the only kosher Burger King in the country. The Centro Israelita Sionista (Zionist Israeli Center) is a large Orthodox compound where a synagogue, library and museum are located. The Museum of History of the Jewish Community of Costa Rica is a non-proft cultural and educational organization at the service of Costa Rican society and the Jewish community. Its fundamental mission is to collect, document, preserve, interpret and spread knowledge on the past, present and future of the Jewish people in general and Costa Rican Jews in particular. The collections the museum owns are guarded for research, reference, entertainment, education and exhibition. The Costa Rican Community opened its museum in September 2005 after 10 years of planning, organizing, collecting and classifying historical and cultural elements. This museum works around different topics, including Jewish religion and culture, the arrival of Jews to Costa Rica and a hall dedicated to remember the victims of the Holocaust, among others. The guided tour is complemented with short videos (10 and 15 minutes). Special lectures are offered to visiting groups around different subjects: * Shoa (including information on what it was like in Costa Rica at the time) * History of Israel from the times of Abraham until today * The Arab-Israeli conflict in the Middle East * Anne Frank. Entry is free of charge, but it must be scheduled beforehand along with personal information of the whole group. Necessary information includes full name, both family names, ID number, address or passport number, origin of visitor and a phone number to be reached if necessary. It must be sent at least 8 days in advance. Museum hours are: Mondays to Thursdays from 9 am to 6 pm/ Fridays from 9 am to 2 pm / Sundays from 1 pm to 5 pm. The Director of the Museum is Vilma de Reifer and its Assistant Director is Randall Antonio Morales Zumbado. Can some one tell me about Costa Rican Jews?